Then I got sucked in. Black Friday found me placing one into the cart. I resisted… and even had it by the door to make the great return. Seems silly to have another gadget, right? But then the slow cooker decided it had enough of my kitchen and quit. As much as I mock the crock pot it’s still handy to have… except the instant pot has a slow cooker function on top of all it’s other features! I was on the proverbial fence. Then came the eggs. Have you tried boiling eggs in your Instant Pot? Those eggs peel like nothing else. I don’t know what it is, but the peel just pops right off. Plus, it’s so great on a Sunday morning to just set the eggs and walk away. Already at this point I realized we might just need the instant pot in our lives. I started playing around with meats. 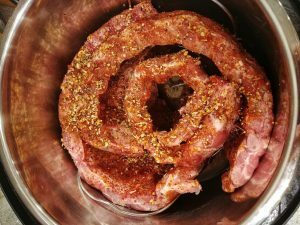 Frozen meat, thawed meat, tough meats, it all worked! I love using Epicure’s Pulled Chicken or Pulled Pork packages for an easy last minute meal. The best part is, you can do it right from frozen! I was SOLD. My instant pot gets used multiple times a week for easy breakfasts (Instant Pot Steel Cut oats) or for meats, soups, and more! 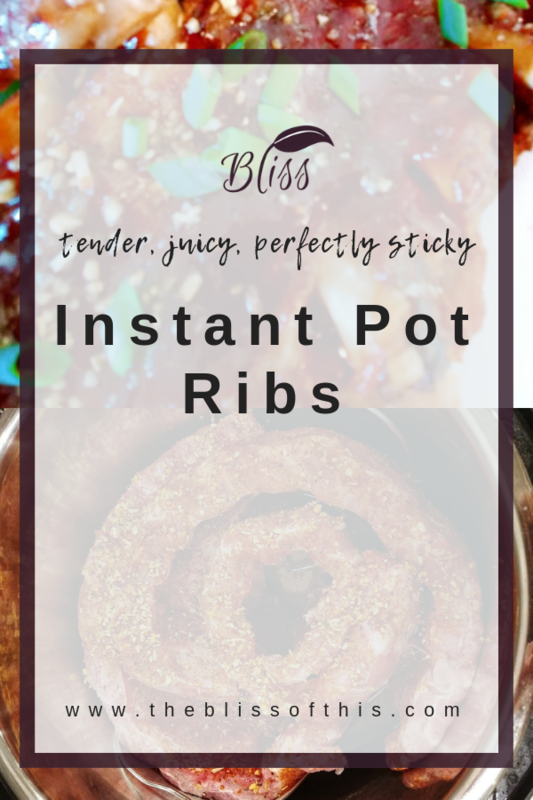 But… what really makes me happy is Instant Pot Ribs. These things are delicious, and SO easy! To be fair, what makes them amazing is not just the convenience of the instant pot, but a quick broil in the oven at the very end of their cooking time. This caramelizes the sauce, to create perfectly sticky, fall-off-the-bone rib. But the time saved, the unbeatable tenderness, and the convenience is thanks to my handy impulse purchase. This recipe is less of a recipe, and more a set of instructions. 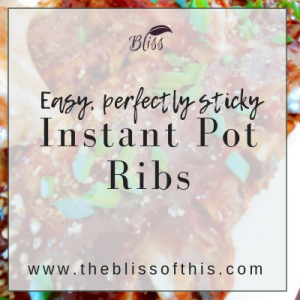 Ribs in the Instant Pot are pretty hard to mess up. What’s fun is that you can really play around with whatever spices you have. I love using Epicure’s mixes- they keep dinner prep a breeze, plus it’s always delicious! Do you have a favorite? I’d love to hear from you in the comments below! SPG – SPG = Salt, Pepper, Garlic. Sounds too simple, right? Nope. It’s actually very popular. 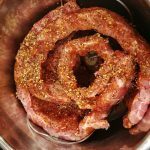 It’s just the right combination of salt, pepper, and garlic to make up a classic seasoning for your ribs, fries, roasted veggies, scrambled eggs and more! Oh Canada Dry glaze- this is a summer only product, but if you are one of the lucky ones that stocked up… this is delicious on ribs! Stay tuned in May for it to make it’s great come back. 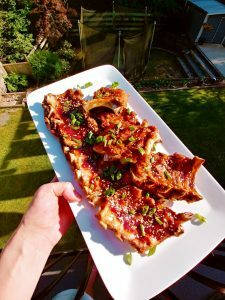 Korean BBQ Ribs – this makes a fantastic BBQ sauce to brush onto the meat at the end, right before broiling. It’s also absolutely delicious on prawns over the BBQ. 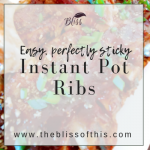 I have done this with a both spareribs and back ribs… and each and every time they are delicious. Rinse off ribs under cool water. Don’t bother to dry them off. Season with whatever you choose… our favorite lately is SPG seasoning. Cook 30 minutes on the manual setting. When timer goes, let them sit for 20 minutes. In the fancy world of the Instant pot, it’s called Natural Release. After 20 minutes you can go ahead and release the rest of the pressure if it hasn’t completely naturally released itself. Be warned…the ribs will be fall off the bone tender! Generously brush with sauce. We love Epicure’s Korean BBQ Chicken and Rib Sauce for this! I’d love to hear from you in the comments below! Would you like to hear from me? Enter your email address on the form at the bottom of this page! 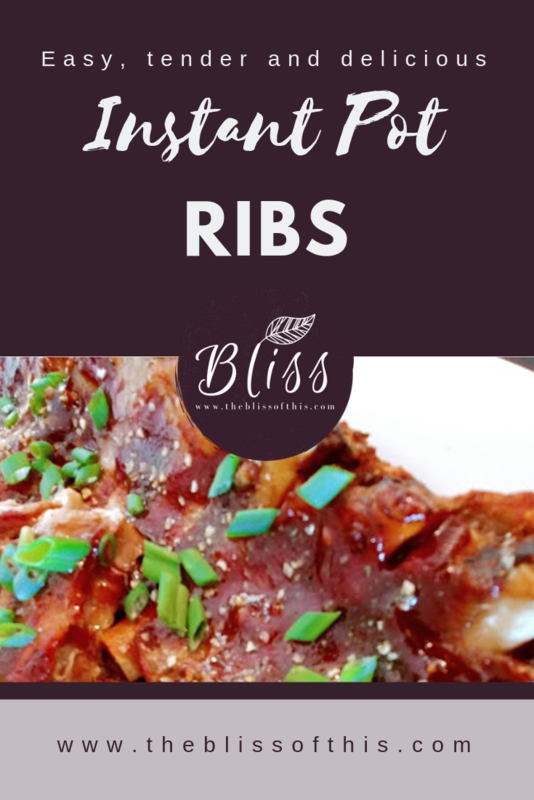 Easy and delicious ribs made in the instant pot fall off the bone. Melt in your mouth tenderness. Rinse off ribs under cool water. Don't bother to dry them off. Season with whatever you choose... our favorite lately is SPG seasoning. When timer goes, allow to rest for 20 minutes. Then manually release. Be warned...the ribs will be fall off the bone tender! Generously brush with sauce. We love Epicure's Korean BBQ Chicken and Rib Sauce for this!